Ideal for general purpose electronic work. Capacitor Box, using 1 rotary dial with 12 steps. Various capacitors are selected one by one. Useful for general purpose electronic work. 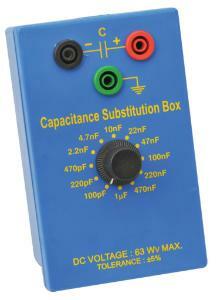 The unit has an easily selectable range of 12 preferred capacitors from 100 pF to 1 mFd. The individual values are 100 pF, 220 pF, 470 pF, 2.2 nF, 4.7 nF, 10 nF, 22 nF, 47 nF, 100 nF, 220 nF, 470 nF and 1mFd. All values of + 5% Accuracy and of 63V ratings.